My sister called my parents yesterday. Dad put her on the speaker so everybody could hear. She and her boyfriend had been thinking. And my sister said there had to be some cats at home. My parents couldn’t have a home without any cats. So she thought that they should get some new -and not just one, but two. And they should be male and brothers. Then they could play with each other and they wouldn’t fight that much. My parents sort of agreed that it was a good idea. But they said they had to wait until they had had their summer vacation – which is a good plan. I will surly come up with other names too, but I can’t think of any right now. Oh. As a last thing I’ll do regarding Pelle, is to write him an ode – like I’ve done with Kasper and Balder. He deserves an ode too. It will be hard since I’ve already written two and there is only so much to write about when it comes to the cats and words that rhymes. My dear cat Pelle died Saturday night – 13 years old. My parents had seen he hadn’t been feeling well since Thursday. They found out he had pain in the back part of his body and it hurt when he jumped down from a chair onto the floor. He had trouble walking Friday morning, but he looked better when they came home from work in the evening. Saturday morning he lay in bed with my parents – on my mum’s side. Mum didn’t mind. When they went shopping later that they he was nowhere to be found. They picked me up on their shopping round and I went home with them. We didn’t find him when we came home. After I had visited my friend Linda, talked to her for a while, been in the kiosk and came back, dad had found him under a couch. We decided to call the vet, because now we saw he had peed blood. The vet back home were my parents live has a 24 hrs duty – you can call if there’s an emergency. We called and she said she could have a look at him. So we went straight to the vet and she examined him with ultrasound among other things. She found out he had bladder that was full. It was a size as a tennis-ball. She drugged him down and had to empty the bladder. First she took out a lot using a needle. After some more drugs to make him more relaxed, Pelle peed naturally – the vet squeezed the bladder until it was almost empty. We got a special diet, a cure against worms and some cat sand. We were told to keep him inside so we could check out if he managed to pee by himself. The vet stressed that this was serious and if it had infected his kidney it wouldn’t be any hope. But she didn’t say anything about his kidney after the ultra-sound and she were very optimistic. We went home believing we had saved his life. Pelle got placed on the bathroom floor where it was warm. He needed to lie on a warm place for a while. It would take up to three hours for him to wake up from the drugs. We all checked on him from time to time. When the three hours was over, I could see he was trying to wake up. He “talked” a bit more and his paws were more active. I went to dad and we both went inside the bathroom. Mum was already asleep. We looked at him for a short while. “Pelle, you’ve been sleeping enough now” dad said. Not long after he stopped breathing. I nearly stopped breathing too. Dad and I looked at him, both very worried. Suddenly he got his breath back – but only for a few more seconds. “Did Pelle just die?” dad said out in the air. “Nooo” I said out loud. Then the tears set in. I almost freaked out. I ran into mum’s bedroom without any clue on how to tell her Pelle had died. I didn’t want to use the words he’s dead. I cried and said his name. Mum didn’t understand anything and asked me to calm down. “I think Pelle stopped breathing” I eventually managed to say to her. Mum got up and we went into the bathroom again. Dad sat near Pelle and just looked at him. I placed myself on the toilet and sobbed. This was not a part of the plan. He shouldn’t die. We had taken him to the vet and she had saved him – we thought. Then he stopped breathing three hours later. It got too much for him. His little heart couldn’t take it. It’s weird that he’s not around. He’s been a part of our lives for 13 years. I have fun when I can use my creativity. And makeing cards is a great way to do so. I could spend hours just making cards. I think, if I wasn’t working in the office I am, I could have a full time job making cards :) i do already make cards for others than myself. Not much though – so far I’ve made three cards for my mum. I had a look at bikuben.com today. 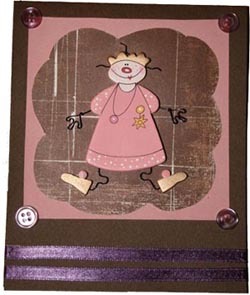 It’s a online shop for scrapbooking things / things to can use to make b-day cards etc. They have a store at Strømmen too (15 mins by car from Oslo). Oh my! I looked around in that shop and I could easliy go crazy inside there. I found so many things I wanted. I’m sure I could spend half my salery in there – easily. I really, really, really want to take a trip to that store and have a look. But I’m afraid if I go there, I’ll be broke in no time. You want a little of this and a little of that and suddenly you got too much! I had my annual talk with my boss two weeks ago. We sit down and go through the last year; what has been bad and what has been good, what can be improved etc. There was a huge survey we had to fill out before the talk. Lots of questions to answer and not every one was easy to answer. I was very nervous before this talk – as I always am. I do handle critisism well, my boss actually told me that, but I was still afraid – afraid that there would be things to critic. The meeting went very well. We were on level about a lot of things and she didn’t have that much bad stuff to say. There were a few minor things, but it was things I was aware of. We both agreed on that I should make a daily / weekly plan over what I’m supposed to do, so I get more structure on my workday. I’ve done that now and things feels better. Right now I feel like I’m doing my job in a better way. I’m up to date on more things and today I actually did some document scanning which I normally hate. I’ve set aside 20 mins a day from 12 o’clock just to scan, so I can get rid of that huge pile of paper that isn’t scanned yet. My desk was almost clean when I left the office and I felt good when I left the office. I really hope this good vibe can stay with me. I usually have some really great days at work, but after a while I tend to fall back into bad habbits again. I really have to focus on keeping what I’ve got! If I can do that, things will be much better. Yesterday I went home to Lierfoss, my hometown, to see Linda. I rode with my parents. Almost home, dad took a detour, to show me where our old neighbours and my parents’ friends are building a new house. We slowly drove by the house and then head home. A little further up that road I see this beautiful tree out in a field. My eyes are automatically drawn to this beautiful tree and I instantly say out loud: that tree would be cool to photograph. I get lots of ideas up in my head. We didn’t have time to stop so I could photograph it. It was not the right time of day either. It was too dark and not enough light to get a great picture, so we just drove on. But I know I have to go back to that tree and photograph it. When I came home I made a note on my cellphone, so I wouldn’t forget. I am going home next weekend, since it’s Linda’s birthday, and then I’m going to take some pictures of the tree. This is how my mind is built. I see things and always think about how it would look as a photograph. And that is why I always carry my Canon with me. I hate it when I see something interesting / beautiful and want to capture it and don’t have my camera with me. I got the camera with my today, but the weather isn’t good today. It’s grey and cloudy, so not any good natural light outside. I wish the sun could come out and play a bit more often. What is it waiting for? Radiumhospitalets Venner (the Radiumhospitals Friends) held a concert in Oslo Spektrum last Thursday. The organisation is new and the reason for the concert was to make publicity about the organisation. The organisation itself is created to contribute to strengthen the hospitals identity and the role as a national and international cancer-center, and to get means to patient-directed actions at the hospital. Jan Fredrik Karlsen and Liv Ulmann were hosts. There were lots of Norwegian artists that contributed for free – like Kurt Nilsen, Arve Tellefsen, Madcon, Ole Edvard Antonsen, Espen Lind etc. In between the hosts talked to various people – people who had cancer, some who had beaten cancer, experts etc. One woman got stuck on my mind. It was a mother of a child who died of leukaemia. She had written a book about it. The name was Idas dans (Ida’s Dance). ‘ I don’t know exactly why, but I got the urge to read that book. So the next day, last Friday, I went downtown to find that book. I found it in paperback and only paid 99 NOK for it. I knew in advance that this book was a book I would find myself crying over – a lot. I cry easily over sad things. And this book, where I knew from the start that she was going to die, I knew it would be hard to read. Still I bought it and read it. By the afternoon was over on Saturday, I was finished. Through out the book I cried many tears. At some times, my vision was so blurry I had to stop reading. What a sad story! My friend Chantal asked me if it was worth it – reading the sad story. I got an insight in how brutally life can be, how fast it can change and what family really means. I got to experience something through this book that I otherwise wouldn’t have known much about. After reading the book, I have questions. How can someone be as strong as the mother who wrote this book? She portrait herself almost like a superwoman in my eyes. I guess when you are in the middle of something like that, you get strength from a place deep, deep down, somewhere hidden. And how can you, when you’re 19, prepare yourself for death? I can not in my wildest dream imagine how you can. How do you live the weeks, days and minutes before you know it’s all over? There were two moments in the book that really caught me. The first was when Ida for the first time expressed to her mother that she was afraid – afraid of dieing. It was heartbreaking to read. The second was when she at the end say goodbye to every close family member (father, sisters, brother). She took time for every one of them. It was painful to read, but also so beautiful at the same time. I’m glad I read this book. It opened my eyes a bit. On to something totally else at the end. I bought this book downtown at Tanum Bookstore. It’s huge and I had trouble find the book. So I asked a woman if she knew where I could find it. I only had the title, not the author. That was enough. Without searching on her computer she told me it was under the section ‘grief’ in the area where health and psychology were. Wow. That woman was amazing. It felt like I could come with any title and she would know where it was.